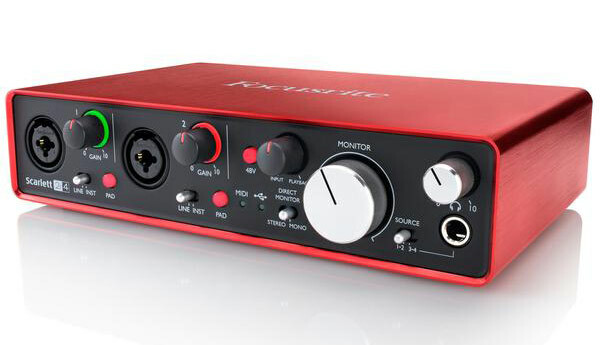 Focusrite Scarlett 2i4 Gen 2 - is a compact and flexible 2-in, 4-out USB audio interface makes it easy to perform and record studio quality audio against a cue mix. Take it anywhere, connect by USB and get two natural-sounding Scarlett mic preamps, super-low latency*, MIDI I/O, four analogue outputs and the same class-leading sound quality and digital conversion as the rest of the latest Scarlett range. Focusrite interfaces are the perfect partner for Pro Tools, so Scarlett 2i4 comes with Pro Tools | First recording software in the box, as well as Ableton Live Lite and a suite of software and samples so you can start recording straight away. As you’d expect, it works flawlessly with all major DAWs on Mac and PC. The latest generation Scarlett 2i4 is packed full of upgrades. It operates at sample rates all the way up to 192kHz with new super-low latency that lets you record and monitor with software effects in real time.